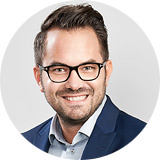 GGeorg Fellinger intuitively meets his customers’ needs and requirements in his position as Senior Key Account Manager of Iventa:M4J Personalwerbung GmbH. He draws on his profound market knowledge collected through years of experience in media, developing individual and innovative solutions. Large customers in north and west Austria trust his interdisciplinary expertise in diverse areas of recruitment marketing. Georg Fellinger studied social and economic sciences and graduated from the VGN Vienna Media Sales Academy.